The Highline is an abandoned section of elevated railway on Manhattan’s Lower Westside. This competition was organized to solicit ideas for its renovation and reuse as a public park. 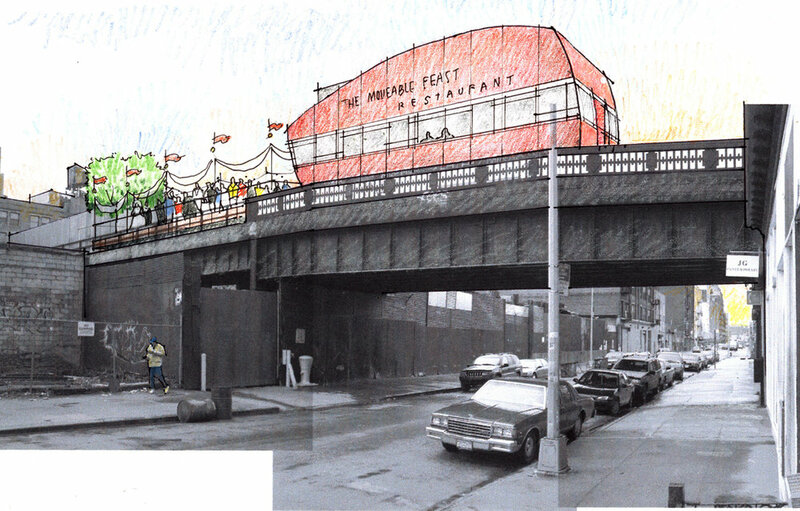 Our design invites visitors to connect with an historic part of New York’s industrial past by riding train cars moving up and down the highline tracks pulled by a cable system at three miles per hour. At any one time 15 cars are moving along the Highline with the remaining cars stored at the Highline rail yard. Cars are topped with a wide variety of amenities and features. Park Cars might provide places where visitors can relax or picnic on lawns, play in playgrounds or play chess on benches while enjoying the views of New York as they travel the Highline. Restaurant Cars might be a breakfast spot or a wedding venue with a garden party car attached. Garden Cars may be sponsored by the city’s botanic gardens featuring seasonal plantings or special exhibits or a community garden with garden groups growing flower borders or vegetable gardens. History Cars might feature the City’s history such as a monument to the area’s meat packing district. Cars in use can change from day to evening and seasonally. Train cars can be boarded at any of six pedestrian hubs, each accessible from street level by stairs and elevators. Within the park itself, pedestrians are allowed to freely access approximately one quarter of the park, with the remaining areas acting as preservation zones which are traversed by the highline train cars and guided pedestrian tours. This dynamic park creates commercial, recreational, entertainment and educational spaces while preserving the weathered overgrown beauty of the decayed structure. The wild nature of the highline is preserved while allowing access to its full length by park visitors creating a new multifunctional venue in lower Manhattan.